A combination of factors has contributed to a disappointing performance from the company's stock over the last year. Here's the lowdown. It hasn't been a great year for the package delivery giants. UPS (NYSE:UPS) and FedEx (NYSE:FDX) have both underperformed the S&P 500, with the latter down almost 30% in the period. What's going on with FedEx, and what can investors expect from the company in the future? The main factors causing the decline are all somewhat connected to each other. A weaker macro-economic environment and global trade friction have led to weaker-than-expected revenue growth. The 2016 acquisition of European package delivery company TNT Express has proved problematic. Burgeoning e-commerce deliveries have pressured margin. 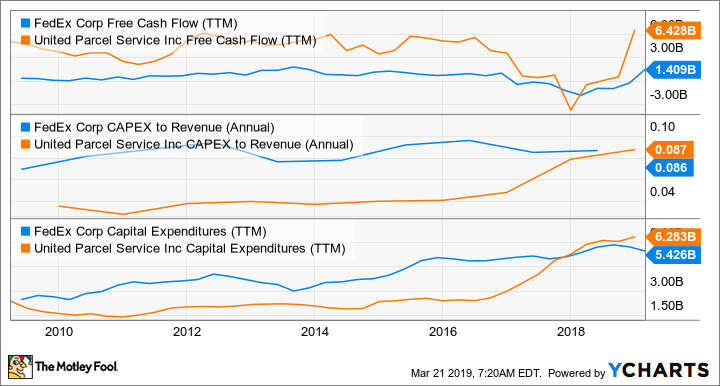 Like UPS, which was forced to raise capital spending plans in order to service future e-commerce growth, FedEx is seeing free cash flow (FCF) constrained in the near-term due to the pressure to spend on its network. UPS and FedEx are both investing for the long-term. Image source: Getty Images. FedEx first warned of slowing in Asia & Europe amid growing trade friction during the second-quarter earnings presentations in December. Fast forward to March, and management has argued that those conditions have extended into the third quarter -- full-year 2019 earnings guidance was cut on both earnings reports. Moreover, CEO Frederick Smith noted that his expectation for full-year revenue was now for a $4.5 billion increase, rather than the $6 billion originally expected. Unfortunately, the weakness in Europe comes at a time when FedEx is integrating its TNT Express acquisition. And the pain doesn't stop there: FedEx is also trying to help TNT recover from the impact of the NotPetya virus attack in 2017. As Smith pointed out on the recent earnings call, "had TNT been a stand-alone company at that time, it would have been bankrupt" as a result of NotPetya. Not only did the attack lead to charges, but TNT also lost market share in high-margin express and parcel products. As a result, FedEx has backed off its target to improve FedEx express by $1.2 billion-$1.5 billion between 2017 and 2020 (TNT is now part of the express segment). It's worth noting that when FedEx agreed to buy TNT, the European company was already in the throes of major restructuring actions -- FedEx definitely did not buy a business in great shape. UPS and FedEx both have strong opportunities to increase delivery volume and revenue with e-commerce growth, but the question is whether they can increase margin as much as many hope. Similarly, how will all the increased capital spending needed to expand and modernize their networks to deal with e-commerce growth and service peak demand during the holiday season affect free cash flow? E-commerce growth brings about margin challenges, as it often involves inefficiently packaged items and/or relatively expensive deliveries to home addresses. As you can see below, both companies have seen lackluster growth in FCF in recent years. Don't be fooled by UPS's current FCF figure, as management expects just $3.5 billion-$4 billion in FCF next year. In addition, UPS has been forced to ramp capital expenditures to the same high levels that FedEx has in the last decade. Both management teams are essentially arguing that the investments are necessary to improve profitability in the future, and will lead to an increase in return on invested capital -- something investors should welcome over the long-term. That's a worthy argument, but the doubts over margin and FCF have hit FedEx stock in the last year. The one thing missing from all of this is, of course, Amazon.com (NASDAQ:AMZN), and the supposed threat it poses to UPS and FedEx as it expands its last mile delivery capabilities. FedEx's COO Raj Subramaniam addressed the issue on the earnings call by pointing out that "Now, there's an intense media focus on the quote unquote, last mile, but very few people think about the first few thousand miles." His point is that FedEx trucks carry shipments "that are originated from all parts of the globe, creating density for Last Mile delivery and higher revenue per stop." Clearly, FedEx and UPS are beneficiaries of Amazon and others' attempts to expand their last-mile delivery capabilities. Moreover, the key problem for UPS and FedEx in the next few years isn't that there isn't enough e-commerce volume to go around, it's more a question of maximizing the profitability of e-commerce delivery growth. For UPS, it probably makes sense to wait until management starts forecasting a cut in capital spending as a share of revenue again -- even though there are signs that UPS is on the right track. Turning to FedEx, if you believe that its investments will prove productive over the long-term, then there's a strong case for ignoring the near-term concerns over margin and FCF as just noise -- in fact, it could be seen as a buying opportunity. That said, there's also the TNT Express integration to think about, as well as the usual concern over revenue growth in a slowing global growth environment. Cautious investors might want to wait until matters become clearer on all fronts before diving in.